Please welcome Jill from, Creative Musings and Such, to Narrating Life. Jill is witty, down-to-earth, and totally capable of inspiring the masses to save the postal service with good mail. You're going to love the gift that she has put together to share with us today. In fact, I kind of just want to make one for myself right now. When I am going to give someone a gift, my approach is usually to be as thoughtful and personal as possible. I believe this stems from the fact that my Love Language is gifts ("Don’t mistake this love language for materialism; the receiver of gifts thrives on the love, thoughtfulness, and effort behind the gift. If you speak this language, the perfect gift or gesture shows that you are known, you are cared for, and you are prized above whatever was sacrificed to bring the gift to you. A missed birthday, anniversary, or a hasty, thoughtless gift would be disastrous—so would the absence of everyday gestures." --Gary Chapman) so it is a big deal for me to do the best I can for the person I am giving the gift to. Disclaimer: this is not always possible, especially when giving a gift to my husband who after 16.11 years of marriage is still a mystery wrapped in a riddle and is practically gift-resistant. But I digress...I have a great love for sending and receiving mail, so several years ago when I participated in a blog swap called Pink Christmas I came up with the idea of making a Good Mail Kit for the woman I was assigned to send a gift to. 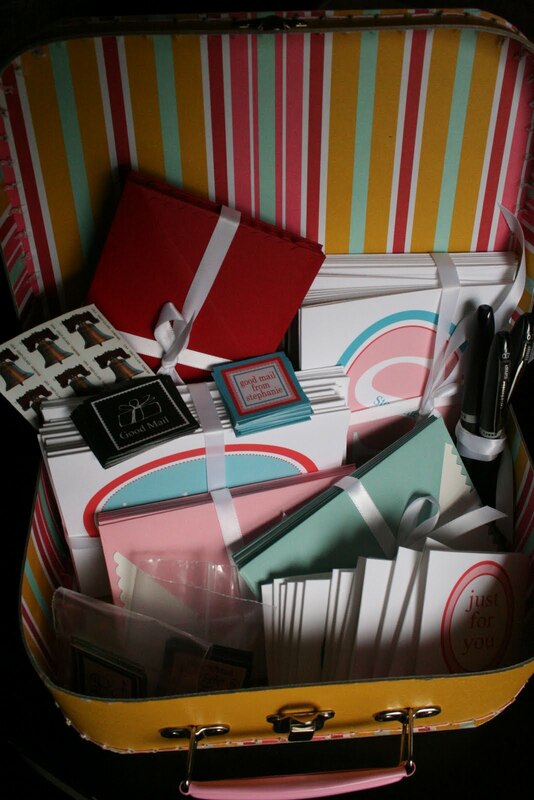 I didn't know her personally, so the best I could do was to use her color preferences and initials for the cards and labels I made to go inside the kit. For her kit, I used the medium size of the world's cutest suitcase as the container for the kit. 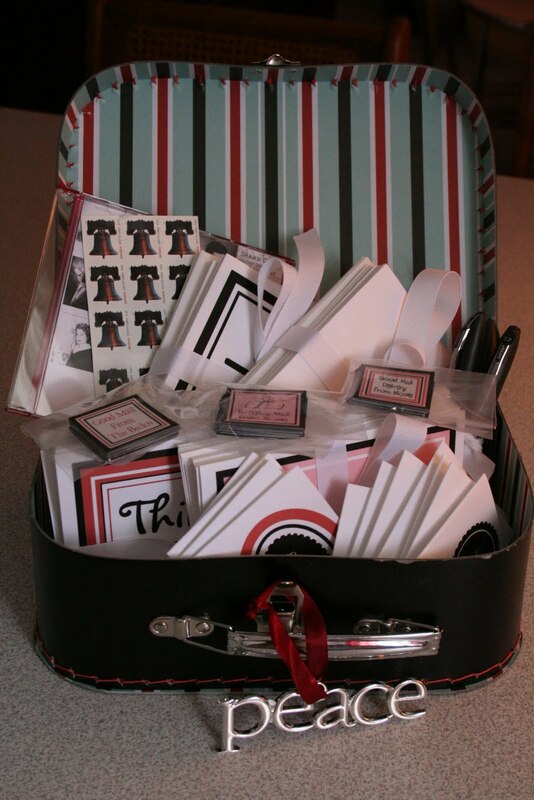 I then took various card/envelope sets and used rubber stamps and rub-ons to create specific sets of thank you notes, birthday cards, and thinking of you notes. I also included some smaller notes to serve as cards to include with gifts. Along with the various sets of stationery, I included several of my favorite smooth-writing black pens, a sheet of postage stamps, and some good mail labels (made by me). I ended up giving this gift two more times as I continued to participate in the Pink Christmas swap (which is no longer happening) and improved upon my idea each year by wrapping each set of note cards in ribbon, because it looks more festive and really, who doesn't love ribbon? 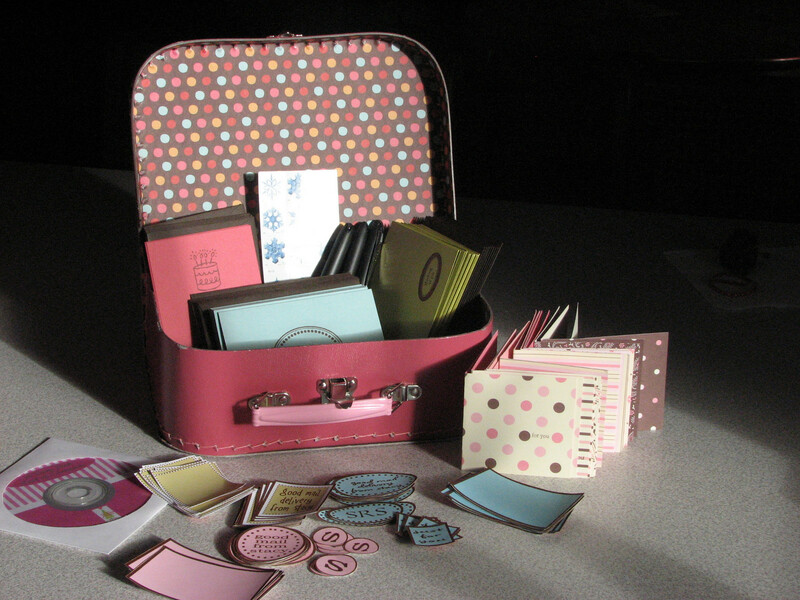 If you were making this gift for someone you know well you could include a small address book or printed copy of family addresses so they could keep everything in the case. You could also make or order address labels so they could just stick them on the envelopes (this may be particularly helpful for those who have a tendency to find excuses for not writing notes). You may have also spied the cds I included with my Good Mail Kits; those were just a Christmas music mix I included just for fun, but if you know how to make those I'm sure your recipient would welcome a mix from you as well. I gotta say, this gift just makes me happy. I have a room overflowing in mailing supplies and stationery, yet when I look at these Good Mail Kits I find myself wanting one. Is there a name for this obsession, stationeryitis perhaps? I don't know. But if loving it is wrong, I don't want to be right. I love this idea!!! SO MUCH! "If loving this is wrong, I don't want to be right." This statement totally cracks me up!! I love Jill's good mail talent and love for stationary. Thanks for sharing so many great ideas and bloggers Miranda! Who wouldn't love that gift? The suitcase is adorable and the good mail supplies inside are to die for. Jill is an inspiration. She writes more cards in a month than most of us write in a year! Seriously. I was the lucky recipient of one of these good mail kits, and I'm still drooling over these photos! Fabulous gift. I LOVE this idea! ...and I totally have stationaryitis. Love it! While I love stationery and most things paper, I do need to be better at using the cards and cute stationery sets I have!